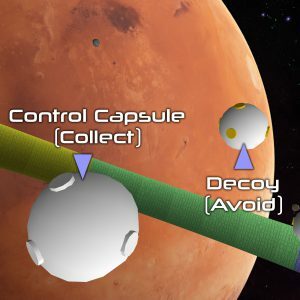 A flock of autonomous Centauri Mine Capsules has formed in orbit around Mars. To destroy the flock, collect all fully white control capsules while avoiding the decoys with orange spots. Fly through all five decoys to collect each one. Decoys can be hard to pick out. For reference, see the image to the right.